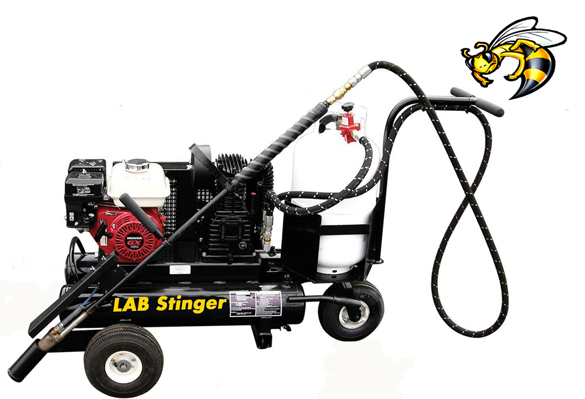 LA*B Manufacturing is proud to announce a new addition to its family of Heat Lances - The Stinger all-in-one portable Heat Lance. The Stinger is a self-contained, portable heat lance on wheels. Easily operated by one person, this unit is ideal for the pavement maintenance contractor in need of a quality heat lance for those small to medium size projects. Critical Purpose: to properly prepare pavement cracks/joints for sealant installation by removing moisture and debris to ensure sealant bond/adhesion. The Stinger comes complete with electronic ignition and stainless steel burner. The 25 foot hose makes for easy access to pavement cracks or the portable cart can be maneuvered with the lance in its holder as shown. Requests by contractors for a self-contained heat lance that was safe, effective and easy to operate prompted LA*B to take action. We are extremely proud to have a self-contained heat lance that exceeds our customer’s expectations. Don’t get stung without the Stinger! For more information visit us on the web: www.HeatLances.com or contact LAB for further information at (513) 577-7200 We look forward to servicing ALL of your heat lance needs.